When you schedule a meeting in Microsoft Outlook and add Skype for Business as the meeting location, it conveniently appends the appropriate "Join Skype Meeting" hot link to the lower part of the invitation. But if you ever need the actual link of that virtual meeting room (such as when you use EventBuilder to add a registration page), finding that link is not so obvious. Your webinar program is growing and you need more help. Should you hire one person to dedicate to managing all that? Or might it make sense to outsource to a team? What is the current attendee experience for a live event in Microsoft Teams? After we discovered a couple things by accident, we thought it useful to pass along analysis and recommendations to equip you to better produce and support webinars using this new feature..
What are Microsoft Teams "live events" or "broadcast meetings?" 17 quick facts. 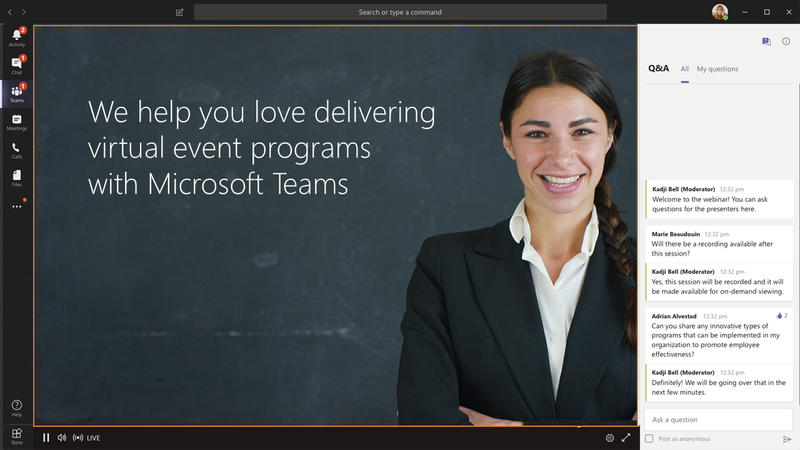 Microsoft Teams live events enables users in your organization to broadcast meetings (video and sharing) to online audiences. Since the live events feature of Teams is new and changing rapidly, here are 17 useful things to know. What percentage of webinar registrants attend? If you want the number to be higher, are you working against yourself? Regardless of your individual use case, there’s a lesson here. Today’s post is brought to by David Carr, founder of a groundbreaking Toastmasters group that is entirely virtual. As you might imagine, this meant rethinking what a speech contest looks like. The process was well-thought out, hiccups were minor, and I thought there was something to be learned from the David's club's experience. Please join me in thanking David for sharing here. Sheba McCants is the Outreach Programs Manager at National Coalition Against Domestic Violence (ncadv.org). Among the many things she juggles, she has recently taken their monthly webinars to the next level by implementing panel discussions.